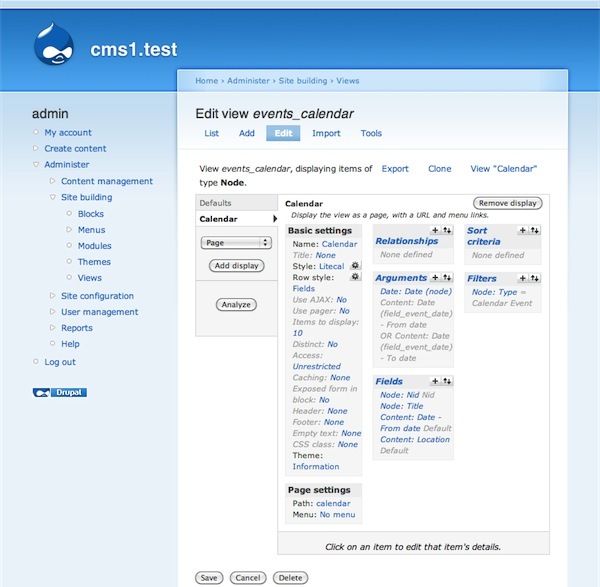 litecal is a small Drupal module written by Development Seed to provide a lightweight calendar display for Drupal sites. Like the larger and more powerful calendar module, litecal is depends on both the Views and Date API modules. Unlike calendar, litecal is relatively small and quite easy to understand. 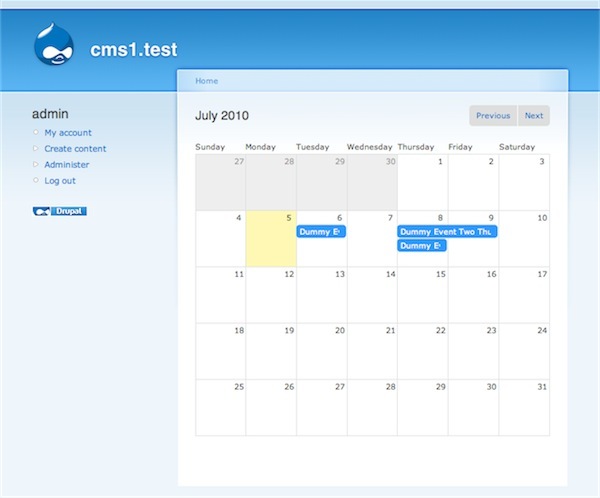 The rest of this post will guide you through installing and using litecal to create a calendar of events on your Drupal site. Content and Text - to store the event data. 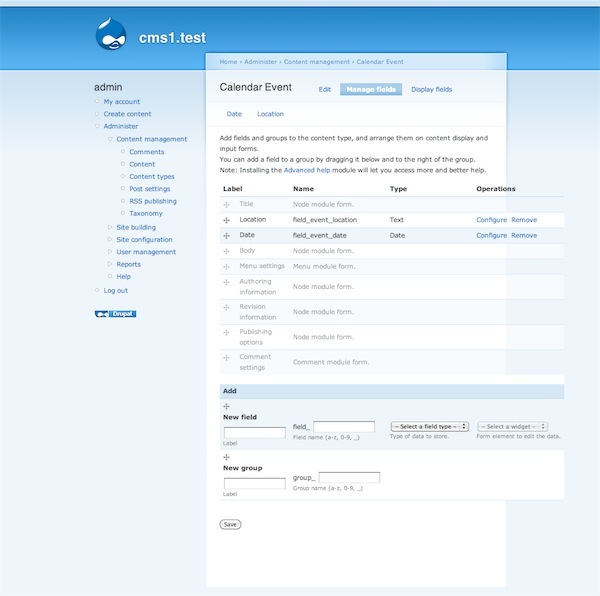 Date and Date API - to process and store date data. Views - to display the calendar. Once you’ve installed the modules you may need to configure them (you’ll need to have set the site timezone, if nothing else), and then move on to the next step. 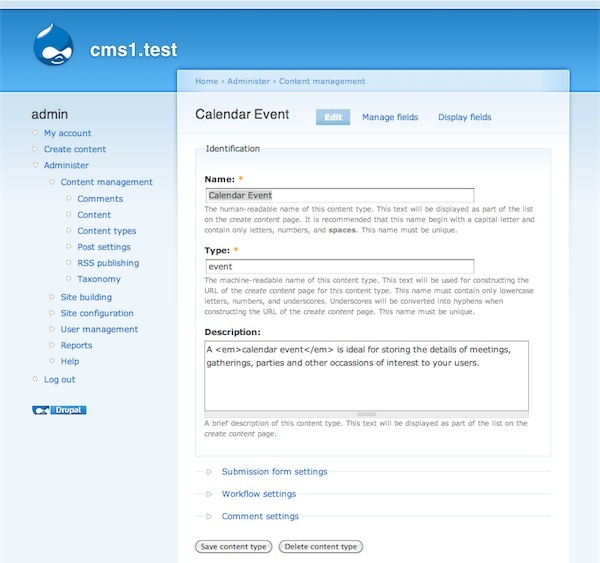 Before you can display events on a calendar, you’ll need somewhere to store them so the first step is creating a new content type. 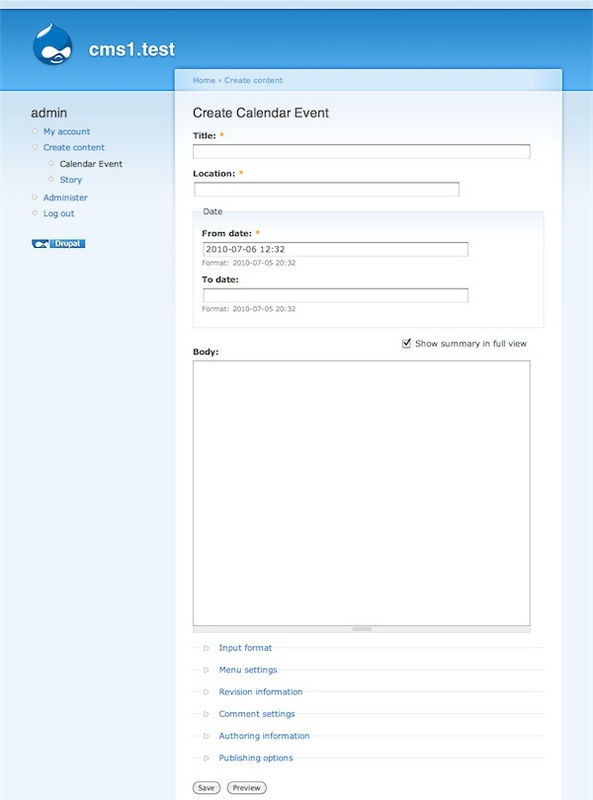 The date field is required (you can’t have an event with no date). The “to date” is optional. At least year, month and day are selected under granularity. Now that you’ve got a Calendar Event node type, create a few dummy nodes so that there’s something to display on the calendar. Four or five should do it, but make sure that a few are this month and one or two in past or future months, or your calendar will be a bit empty! A filter Node: Type = Calendar Event. A Date: Date (node) argument (select the Current date as default argument, Month granularity, both From and To dates, and OR method). A Content: Date - From date field from your content type, a Content: Location field, and a Node: Title field. Now add a new Page display to the view, set its Name to Calendar, the Path to calendar, and override the Style and set it to Litecal (leave the style options as the default values). 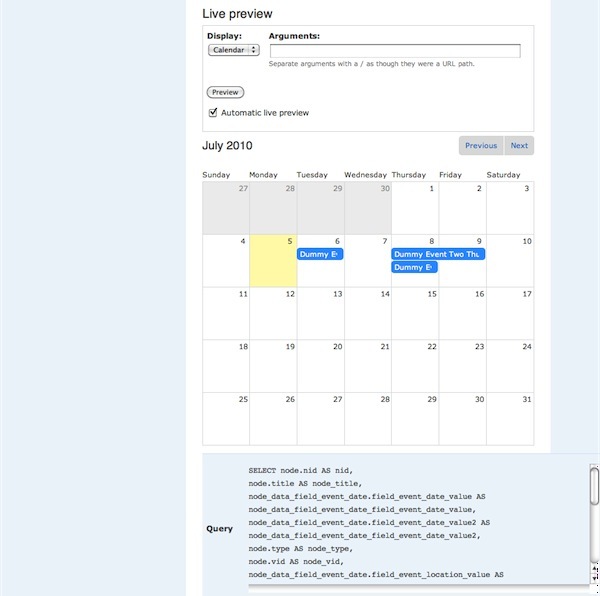 Save the view, then select the correct display under Live Preview and you should see the dummy nodes you created earlier on a calendar of the current month. If not, then you’ve missed a step above (perhaps the default value or granularity for the argument?). You’ve seen how easy it is to get started with the litecal module. In the next post, I’m going to introduce a few more sophisticated ways you can use litecal to build more complete user interface. This post was published on July 5, 2010 and last modified on April 4, 2019. 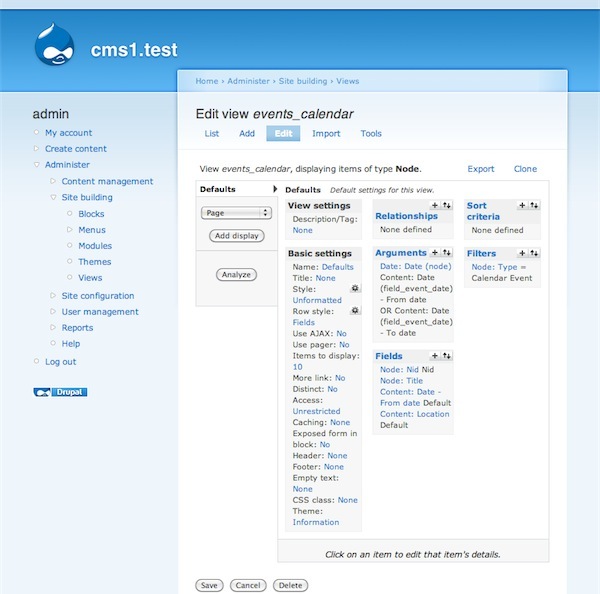 It is tagged with: drupal, views, date, calendar.